Winning Credit Card Disputes for WordPress Plugins And Themes [VIDEO] Is It Possible And How To Do It? 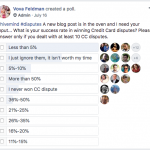 The article Winning Credit Card Disputes for WordPress Plugins And Themes [VIDEO] Is It Possible And How To Do It? appeared first on Freemius.